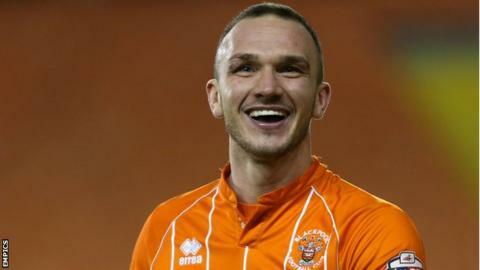 Tom Aldred's header earned Blackpool a hard-fought victory against Wigan in wet conditions at the DW Stadium. Defender Aldred's first-half effort from a corner was enough to earn the Seasiders all three points. Substitute Donervon Daniels had a chance shortly after the break to equalise for the home side but saw his free header go wide. Wigan could not find a breakthrough in the second half, as Blackpool moved out of the League One relegation zone. "It's a massively disappointing result. "We didn't put the ball in the box as much as we should and we didn't create enough opportunity from our good play. "But there were spells in the game where I thought we did okay. "The disappointing thing is that we got it to good areas and didn't make enough of it." Match ends, Wigan Athletic 0, Blackpool 1. Second Half ends, Wigan Athletic 0, Blackpool 1. Attempt saved. Jason Pearce (Wigan Athletic) right footed shot from the centre of the box is saved in the top centre of the goal. Donervon Daniels (Wigan Athletic) wins a free kick on the right wing. Attempt missed. Hayden White (Blackpool) left footed shot from the left side of the box is close, but misses to the left. David Perkins (Wigan Athletic) wins a free kick on the left wing. Attempt saved. Michael Jacobs (Wigan Athletic) left footed shot from outside the box is saved in the bottom right corner. Corner, Wigan Athletic. Conceded by Emmerson Boyce. Attempt saved. Jason Pearce (Wigan Athletic) header from the centre of the box is saved in the top centre of the goal. Corner, Wigan Athletic. Conceded by David Ferguson. Substitution, Blackpool. John Herron replaces Mark Cullen. Attempt missed. Donervon Daniels (Wigan Athletic) header from the centre of the box misses to the left. Substitution, Wigan Athletic. Alex Revell replaces Donald Love. Substitution, Blackpool. Emmerson Boyce replaces Will Aimson. Attempt blocked. Leon Barnett (Wigan Athletic) right footed shot from the centre of the box is blocked. Attempt blocked. Donervon Daniels (Wigan Athletic) right footed shot from the centre of the box is blocked. Corner, Wigan Athletic. Conceded by Dean Lyness. Attempt saved. William Grigg (Wigan Athletic) left footed shot from the centre of the box is saved in the top centre of the goal. Attempt blocked. Reece James (Wigan Athletic) right footed shot from the centre of the box is blocked. Attempt blocked. Yanic Wildschut (Wigan Athletic) right footed shot from the centre of the box is blocked. Attempt missed. Donald Love (Wigan Athletic) right footed shot from outside the box misses to the left. Substitution, Wigan Athletic. Michael Jacobs replaces Craig Davies. Attempt missed. Donervon Daniels (Wigan Athletic) right footed shot from the centre of the box is close, but misses to the right. Corner, Wigan Athletic. Conceded by Tom Aldred.